The Falken Azenis RT-615K tire is one serious high performance tire that simply put, is not for everyone. It’s mainly geared towards high performance cars and drivers who are into street or track racing. That said, this Falken tire does provide good manners on the street or highway though. The aggressive tread design is built to 8/32″ and has the aqua grooves and a solid center rib to give it good traction on wet pavement, and exceptional control on dry pavement. Due to its huge shoulder blocks you can expect solid grip and increased durability. Falken knows a bit about racing, and they have included some nice technology into the Falken tires. The design of the casing is such that it reduces weight, yet has a 200/A/A UTQG rating, which is rarely found in a street legal tire. While this model is a beast in providing very good handling and steering response on dry or wet road surfaces, it goes without saying that you should not even consider taking it for a spin on snow or ice covered roads. The price on these Falken tires range from a low of around $90 on the 14″ series tire, to approximately $395 for the massive 315/30-R18″ series model. 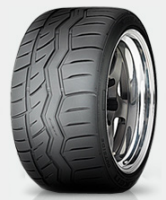 Who Are Falken Azenis RT-615K Tires Designed For? Falken has designed the RT-615K tire for drivers who are looking for a DOT street legal racing tire that they can also use at the track with their high performance cars. Falken tires provides no treadwear guarantee on the Azenis RT-615K as you might expect. They do however provide a first 1/32″ wear uniformity warranty, and an unlimited time frame guarantee on materials and workmanship. This applies for the life of the tread down to a 2/32″ of tread depth. Falken will replace the affected tire free of charge.